How to get to Sinaia, Romania: by car, plane, train. We provide transfer from any location! 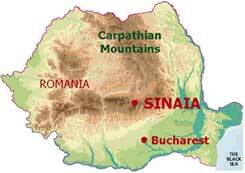 We provide transfer by car/minibus to/from Sinaia. This should be specified clearly in advance. The closest airport is "Henri Coanda" Bucharest International (former Otopeni International). All major international airlines fly to/from this airport. Sinaia is situated on express road DN 1 (E 60) at 120 km distance from Bucharest, 100 km from Henri Coanda International Airport (former Otopeni Airport), and 60 km from Brasov. DN 1 (E 60) is an express road, having 2 lanes per sense on most of it, hence, good travel speeds can be reached. Sinaia is situated on Bucharest - Brasov railway. There are plenty of trains from both Bucharest and Brasov. Sinaia is an important train station, hence, all trains stop here. For more details see here. Several companies operate routes on Prahova Valley via Sinaia. There are long distance lines (ex. Bucharest - Tg. Mures). The stop of the long distance lines is in the parking lot of the Railway station. There are plenty of local lines (ex. : Azuga - Campina) which can give you a lift to nearby towns (Busteni, Azuga). The local lines pass the center of town and stop in the bus stations.